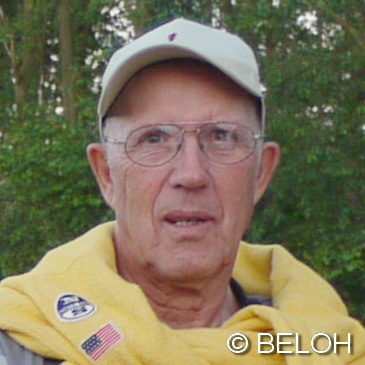 Andreas recently brought here a posting to the Jericho labyrinth St. Gallen which probably shows the historically first crossing of the main axis in a classical labyrinth. I have written about that already. But now I would like to do it once again. Because for me it seems to be an element to design the labyrinth which I have not seen anywhere. I became aware of that when I have no longer drawn the labyrinth from a seed pattern, but from the path sequence. And, besides, have noted that there also are different possibilities to connect the lines. 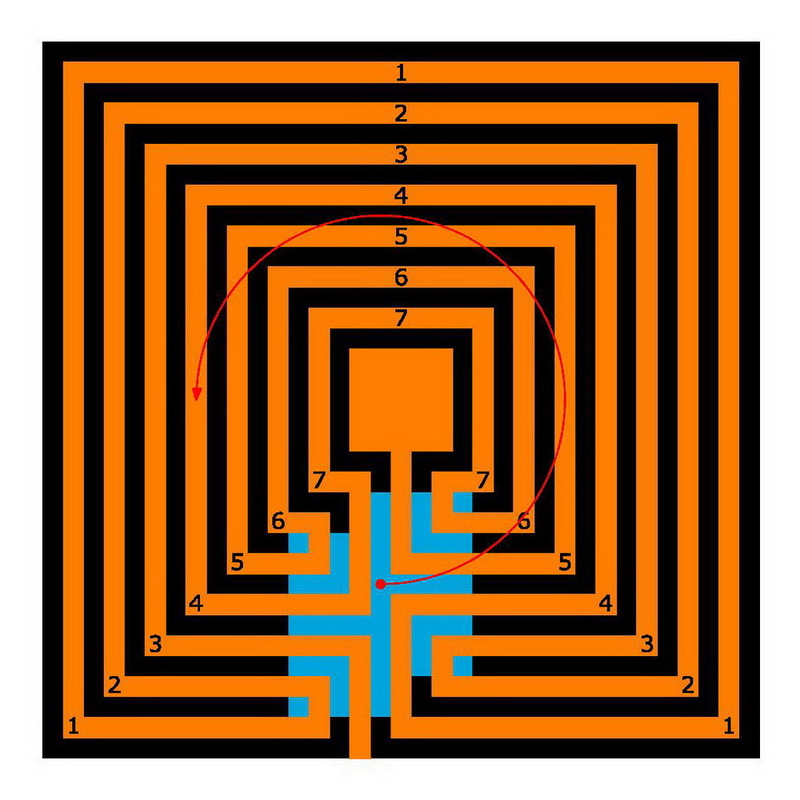 Using the example of the classical 7 circuit labyrinth I will explain this once again. 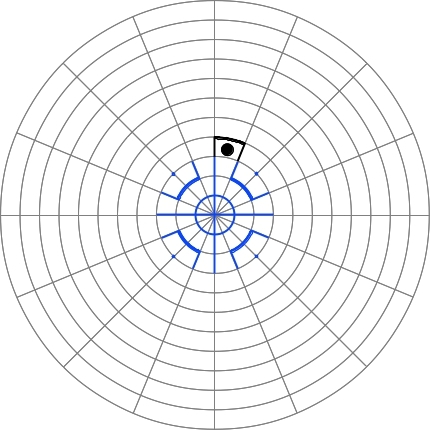 How many possibilities to cross the axis are there, and how does it look like? 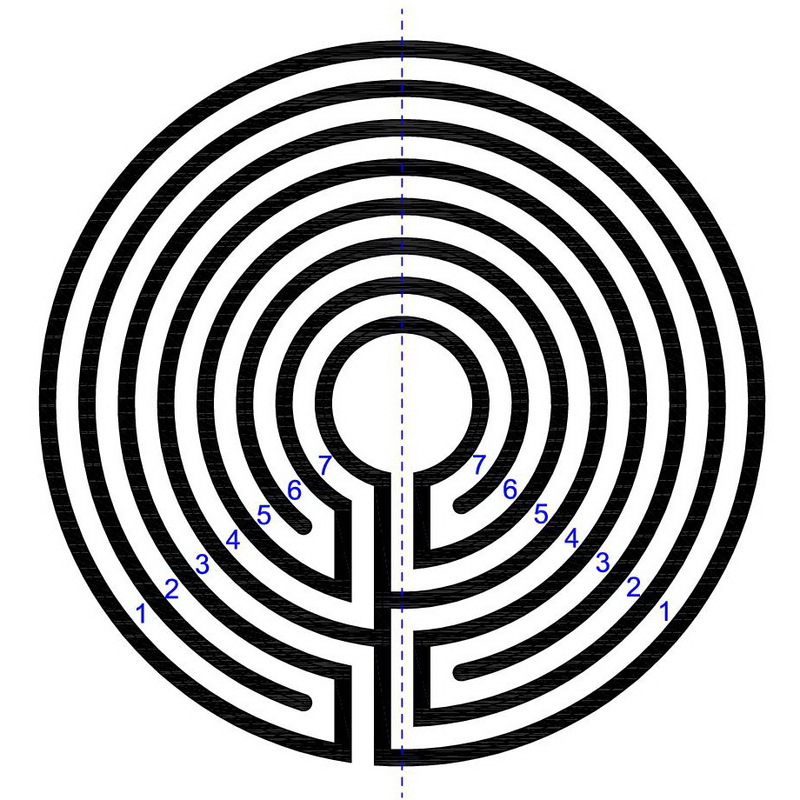 First the original labyrinth, however round and with a bigger middle. 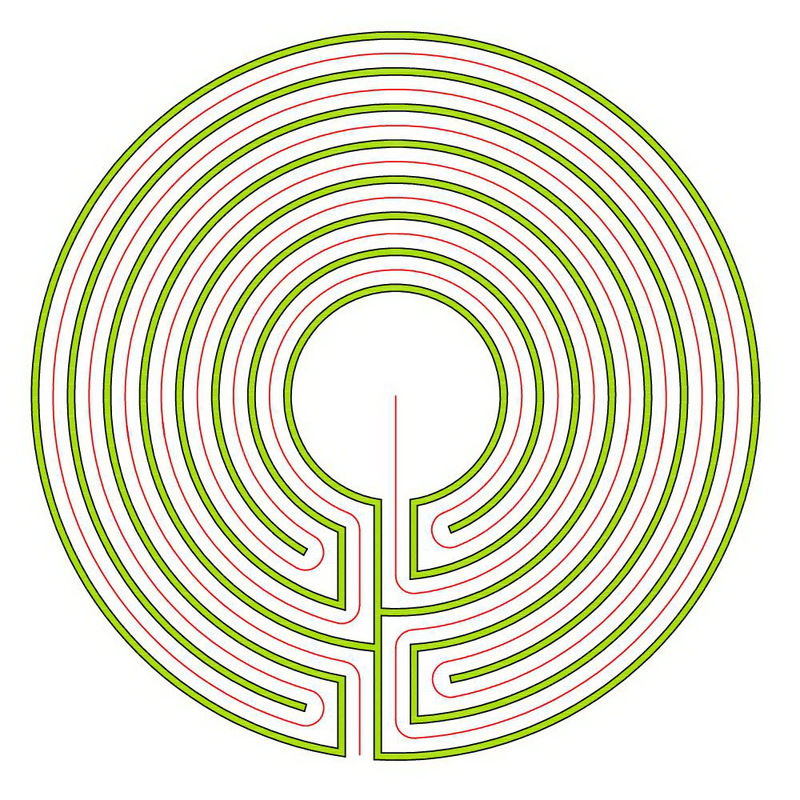 The last path sequence into the middle lies on the vertical main axis. The entrance lies on the left side of the main axis, leads to the third circuit, and turns to the left at first. The entry into the middle takes place from the fifth circuit from the right side, and faces the entrance. How often can I now traverse the axis? At two positions: From the first to the fourth circuit, and from the fourth to the seventh circuit. This can happen at each position alone or at both positions together. The result are three variations. By crossing the main axis from the first to the fourth circuit I do not change the direction of movement as in the original labyrinth. I am still turning to the left in the fourth circuit. However, thereby I also reach the middle from the left side, so to speak I have laid this entry on the other side of the main axis. The main entrance slides a little further to the left, and the two lower turning points also move to the left. Here the change from the first to the fourth circuit remains like in the original, however, from the fourth to the seventh circuit I maintain the “spin”. The entry into the middle is executed from the left side as it is in the original. However, the main entrance slides to the right side. Both lower turning points are shifted to the right. The vertical main axis is crossed twice as in the previous versions, now together. Through that the lines are displaced considerably. Everything moves to the left. The main entrance lies again on the left side, the entry into the middle is made from the right side. Maybe one can dismiss that as unnecessary? It would be nice, nevertheless to try it out in practice. Above all how it feels to experience another change of direction than in the original. Maybe the opportunity arises in a big sandtable exercise? On a sandy beach for example? Where one can simply scratch the lines into the sand, and allows the flood to erase them out leniently. 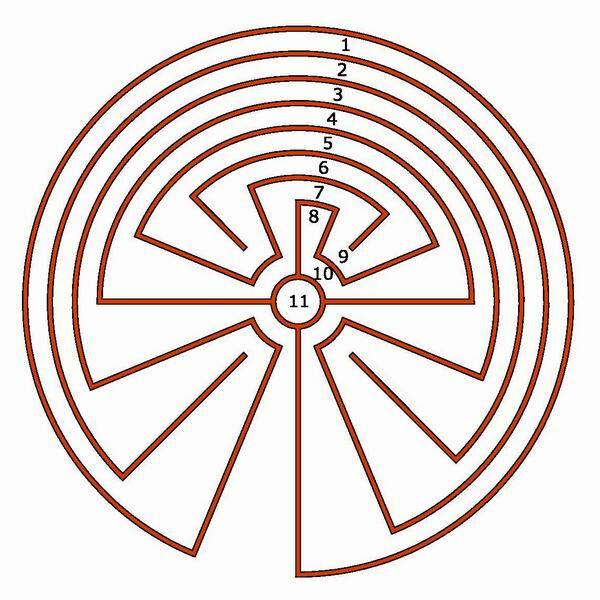 The oldest known labyrinth figure is the Classical 7 Circuit labyrinth (sometimes also called: the Cretan labyrinth). Its origin is about 1200 B.C. The further development falls in the time of the Roman empire from 165 B.C. till 400 A.D. The general name is Roman labyrinth and there are different types again. They have in common that different sectors (mostly four) are run one after the other. 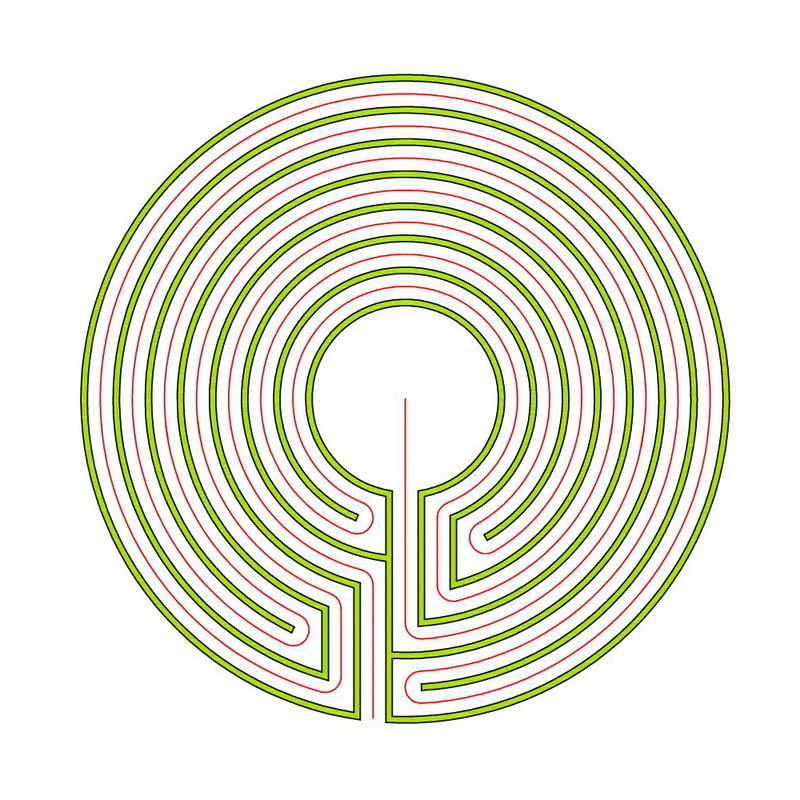 In his book “Labyrinths and Mazes of the World” (published in 2003 by Gaia Books, London) Jeff Saward has described how the development of the Roman labyrinth from the Classical labyrinth is possible. Her I only want to put this across in a few steps. We begin with the Classical labyrinth in square form. In the drawings the boundary lines are shown in black. The seed pattern contained therein is emphasized in blue. 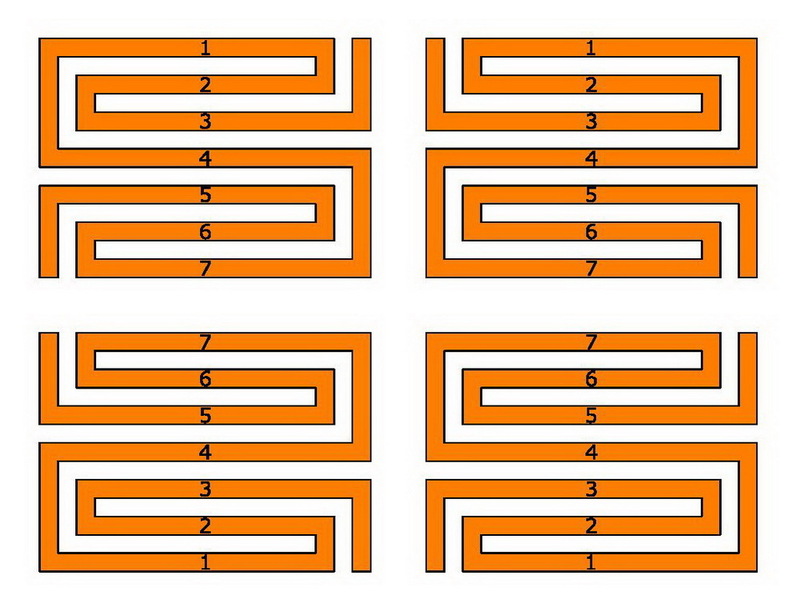 The ways are put in orange, in the same width as the boundary lines. 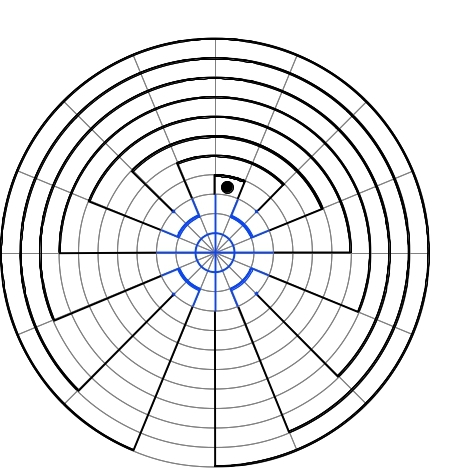 The whole figure is reduced to a quarter through a rotation. 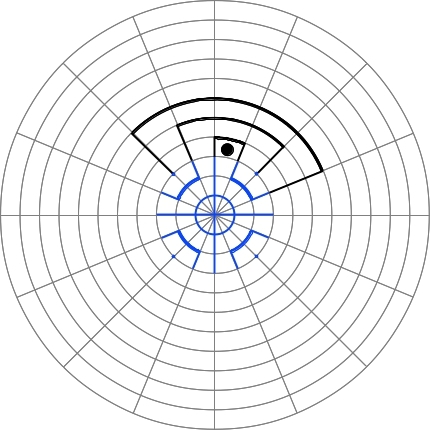 The vertical parts of half the seed pattern move to a horizontal line. To generate an entire Roman labyrinth from the quartered labyrinth, another two circuits must be inserted in every sector: One around the middle, and one at the outside. 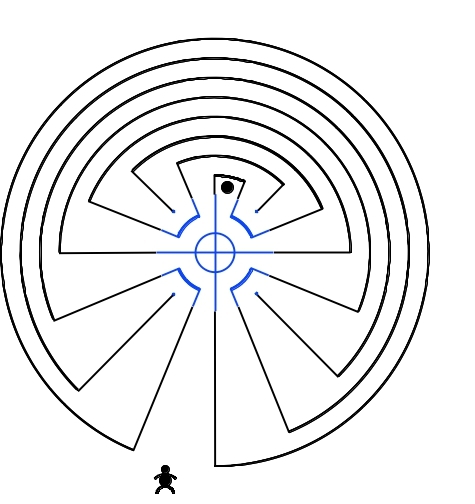 In the outer rings one walks to the the next sector, the last path leads to the center. If one examines exactly the paths, one can recognize that the way is the same as the way back in a Classical labyrinth. Or differently expressed: In a Roman labyrinth one wanders four times the way back of a Classical labyrinth. The path sequence can be understood with the help of the figures. So one well can see the Classical labyrinth inside the Roman labyrinth. 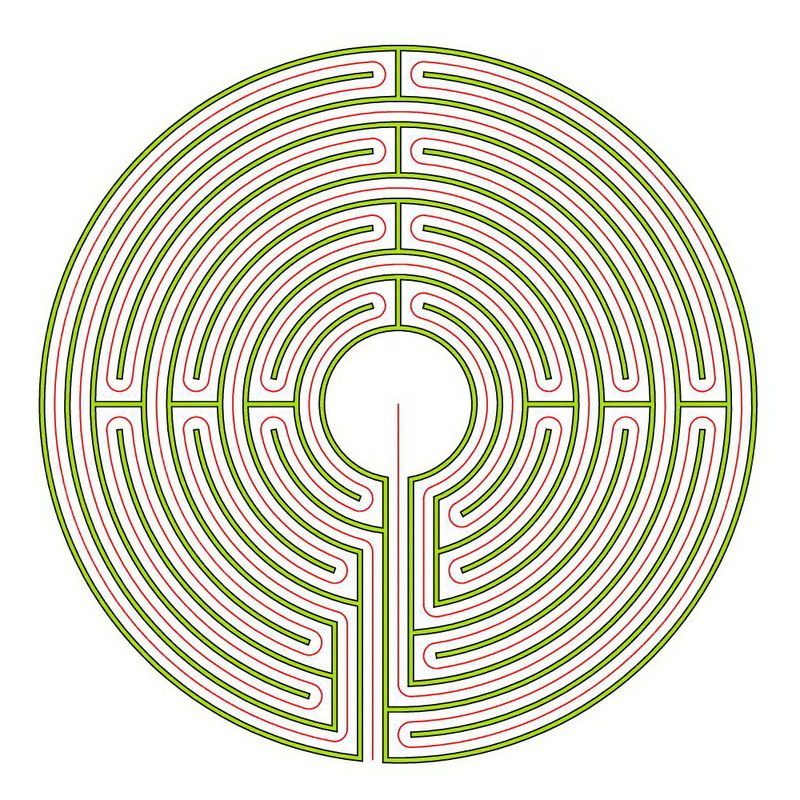 Even better one recognizes the relationship with the Classical labyrinth in the diagram illustration. 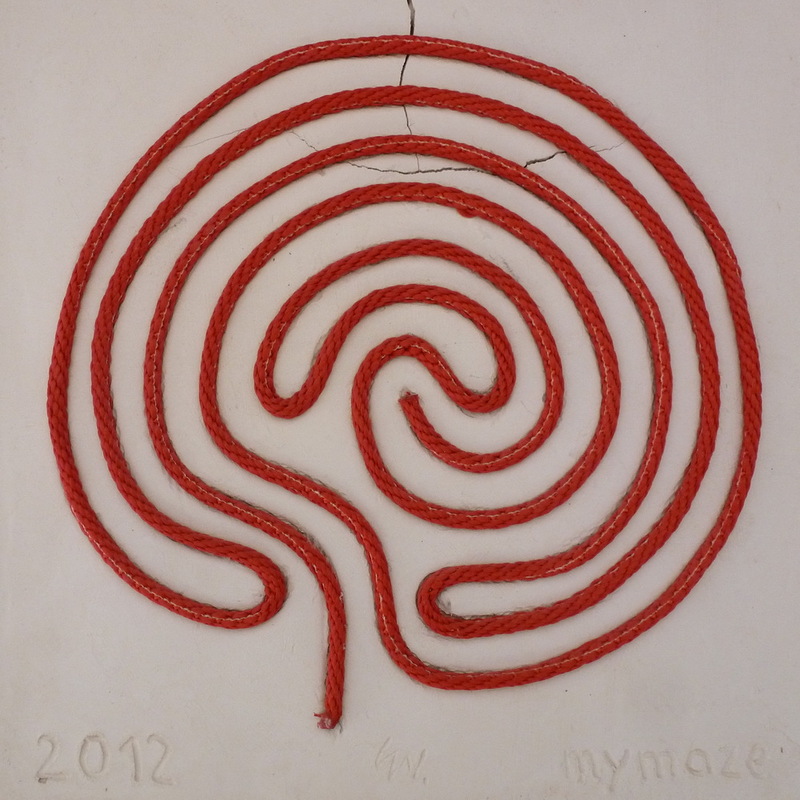 The Roman labyrinth is self-dual like it is the Classical labyrinth. One sees this well in the following graphics. 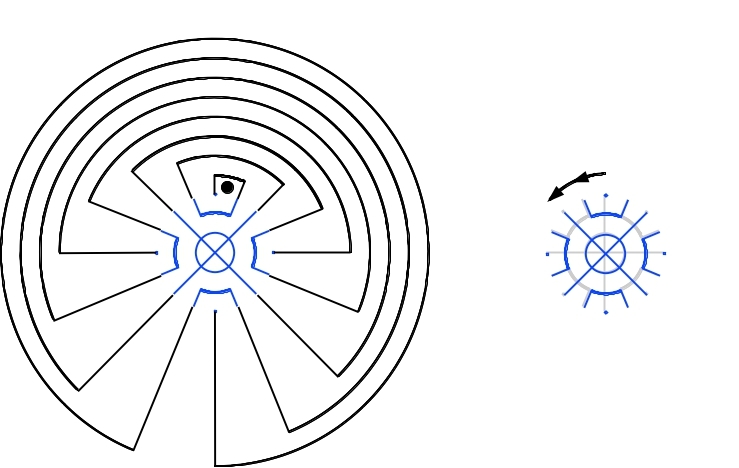 Howsoever the diagram is rotated or mirrored, the path sequence is always the same. Also it plays no role whether one walks in direction to the center or reversed, or whether one fancies the entrance below or on top. There are different historical Roman labyrinth of this kind. The oldest one comes from the second century A.D. and is to be seen on a mosaic in Pont Chevron (France). This is why Andreas Frei calls it type Pont Chevron (see link below). Many are surprised how long the way in a labyrinth can be, especially if they walking labyrinth for the first time. And many who want to build a labyrinth, e.g., with stones or with candles, are astonished how much material they need. If I stand ahead of a labyrinth, the middle, the goal is within my reach. However, only when walking in I get to know how winding and complicated the way is in reality. But yet, this way, the red thread or Ariadne’s Thread is the continuous line in the labyrinth, without crossroads or junctions. In the drawing I call “A” the beginning of the path and “Z” the goal, the center or middle. In many labyrinths I could reach directly the middle with a few steps across all limitations. 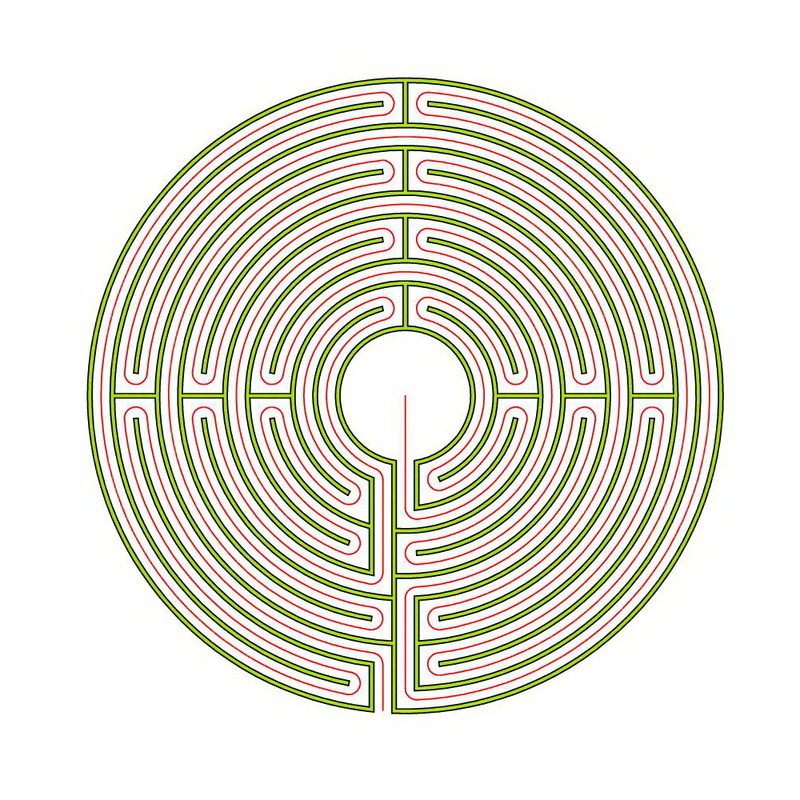 But this is not really what is intended with a labyrinth. 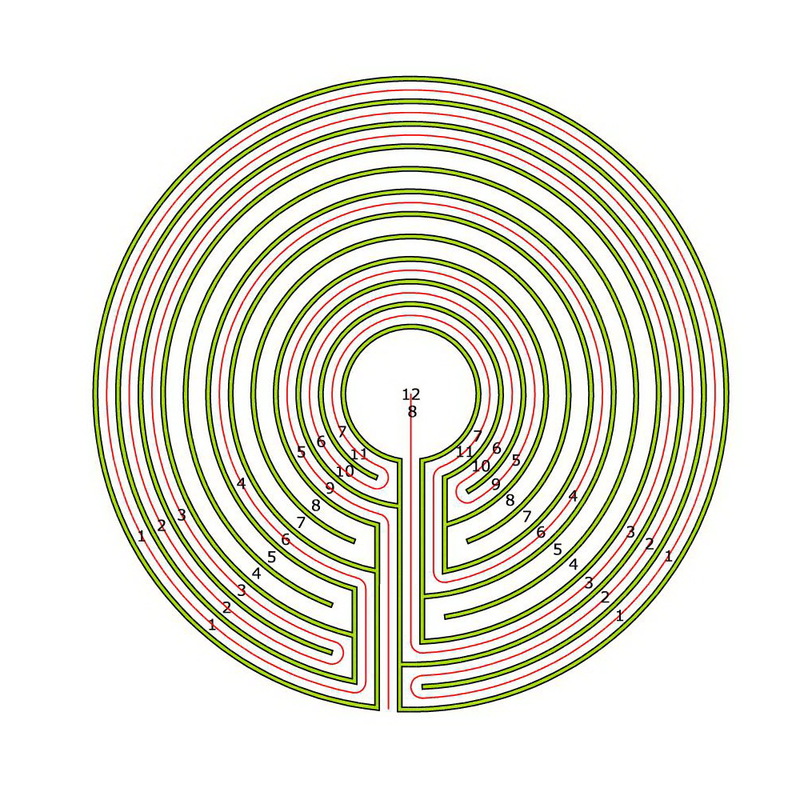 Now I compare for a 7 circuit labyrinth with a diameter of about 15 m the short way (direct connection between A and Z) with the long way along the Ariadne’s Thread. The length of the short way amounts to 6.33 m, the long way has a length of 154.62 m. Or differently expressed: The long way is 24.4 times longer than the short way (154.62: 6.33 = 24.4). One could also see in this a formula for the labyrinth. To calculate how powerful is the layout for example. Or how wended is the way? Or from what minimal surface area I can extract which maximal length? Maybe one could call this value in honour of Hermann Kern “detour factor” 24.4? 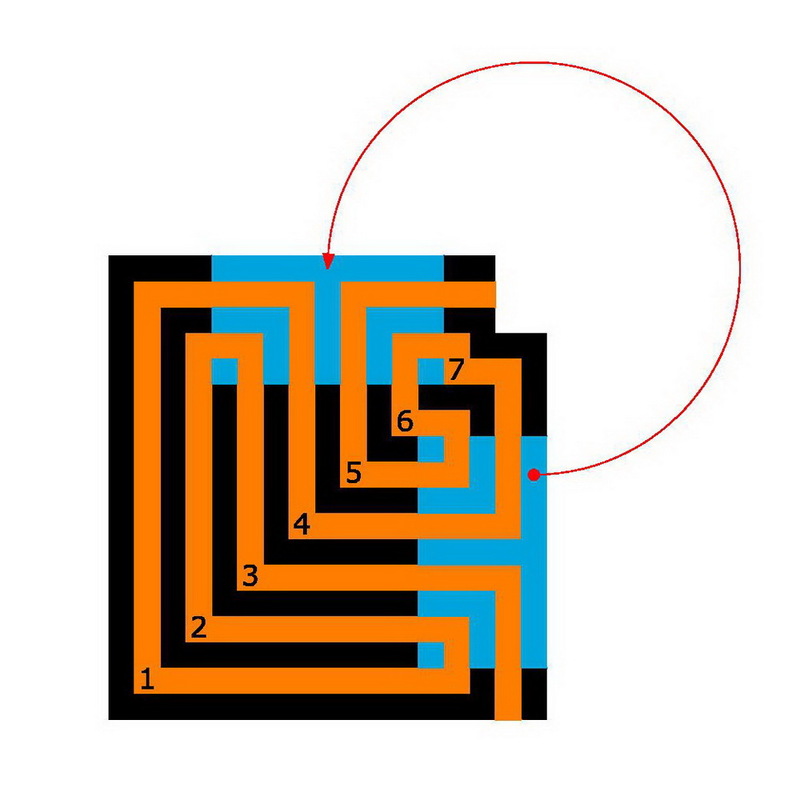 If I handle this thread at the beginning and at the end and pull it apart, I will get a straight line which reaches from “A” to” Z” and is as long as the way inside the labyrinth, i.e. 154.62 m.
I can arrange this to a circle. 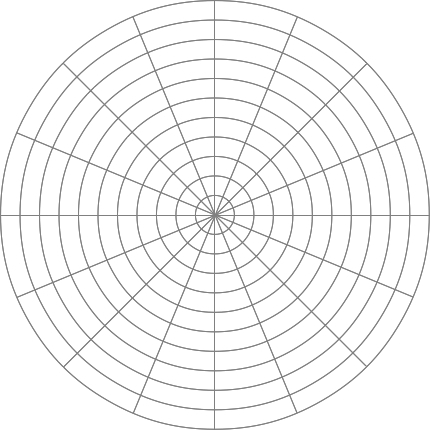 The perimeter corresponds to the straight line of 154.62 m. The resulting diameter would be 49.22 m.
I can also make a square with the same extent from it. 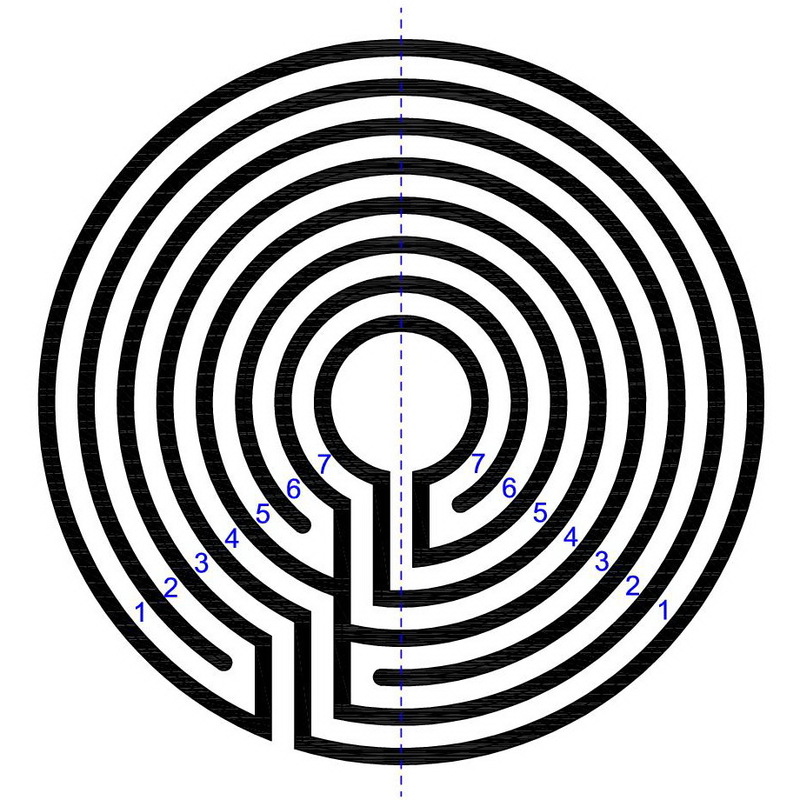 Then this would have four side lengths of 38.65 m.
The labyrinth next to the Cretan is the Snail Shell labyrinth. 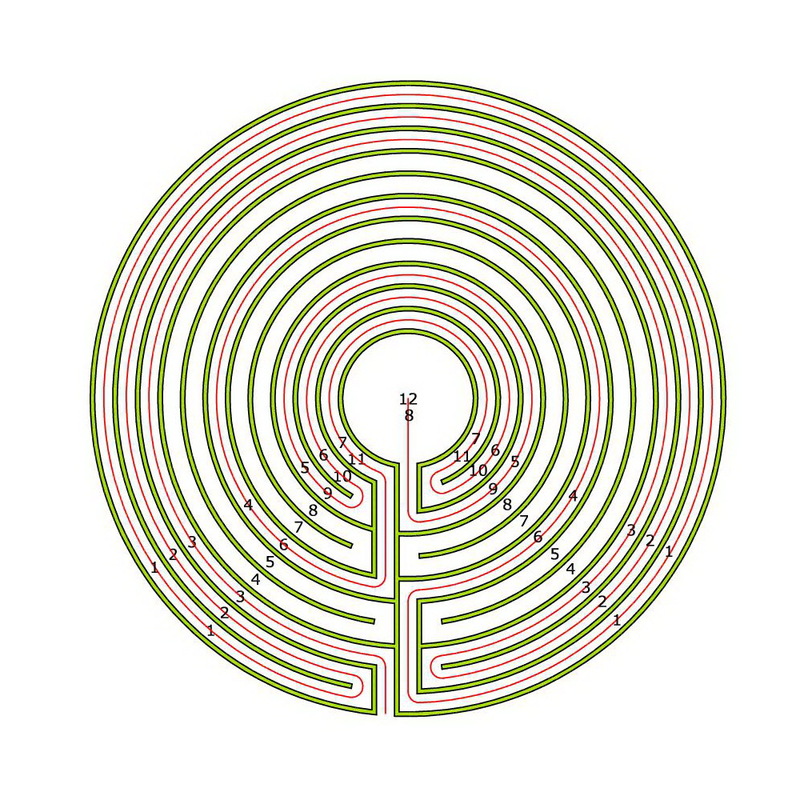 These two labyrinths have the same seed pattern. And they are the only ones with this seed pattern. 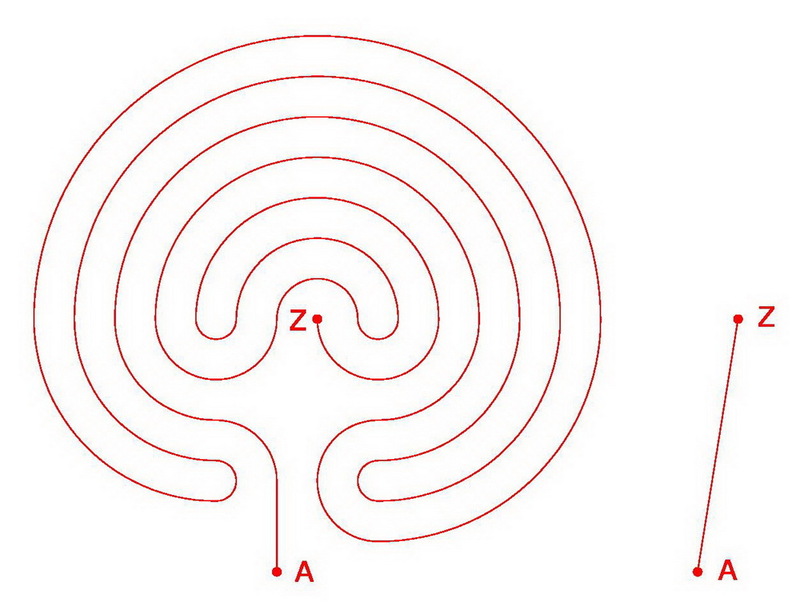 Well, how then do we draw a Snail Shell labyrinth in the Man-in-the-Maze (MiM)-style? 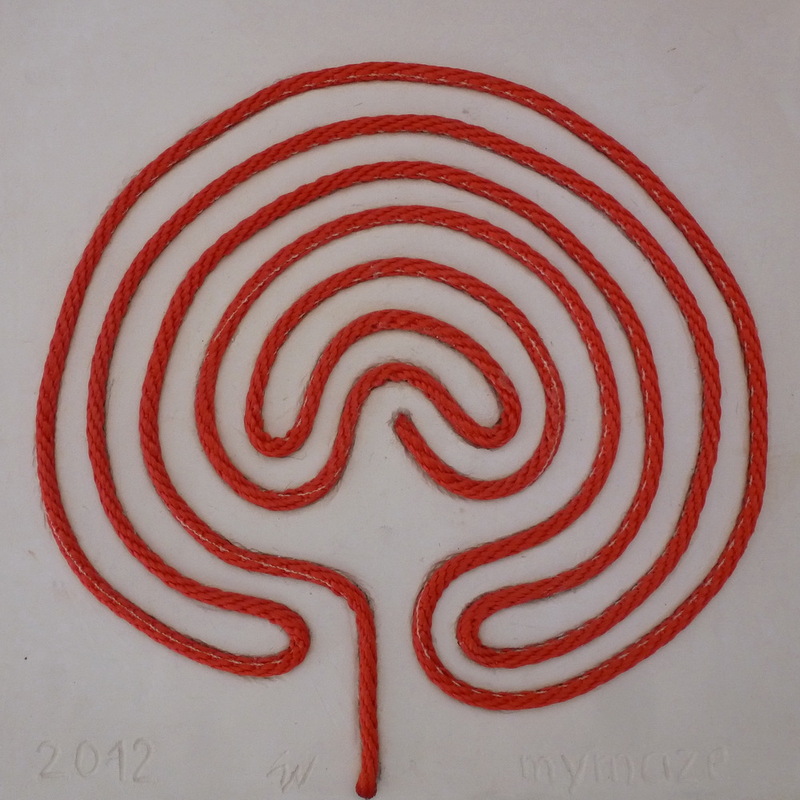 Very simple: we just use the Cretan labyrinth in the MiM-style from our last post (see related posts below). 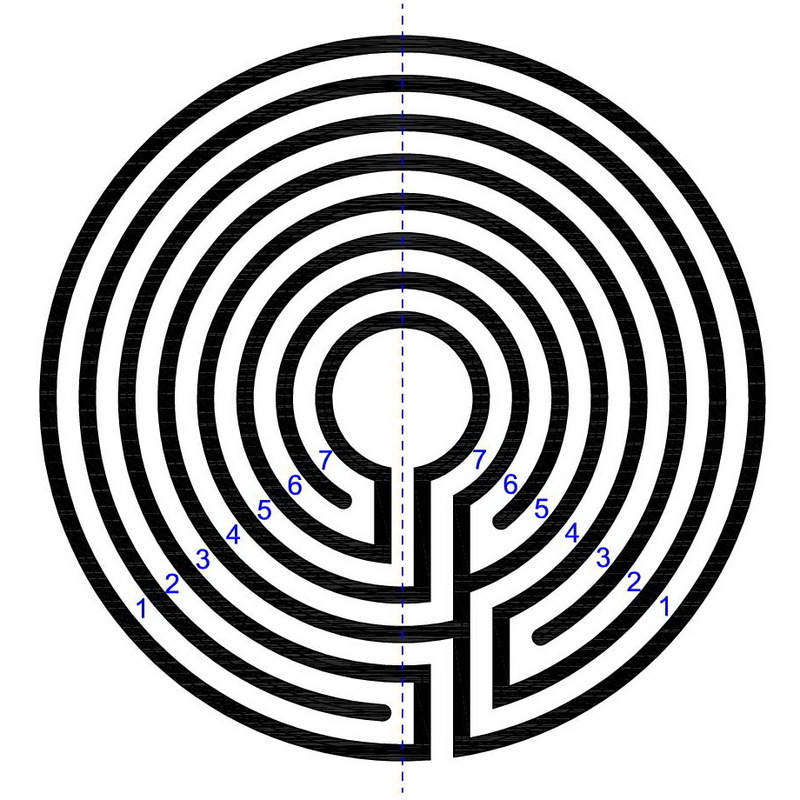 This labyrinth rotates clockwise. And now let’s rotate the seed pattern, whilst keeping everything else in place. 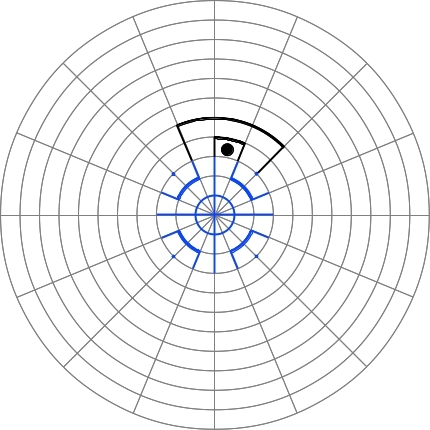 Rotating it by one step in anticlockwise direction connects the center to the next intermediate space on the same quadrant of the seed pattern. This generates the Snail Shell labyrinth in clockwise rotation. 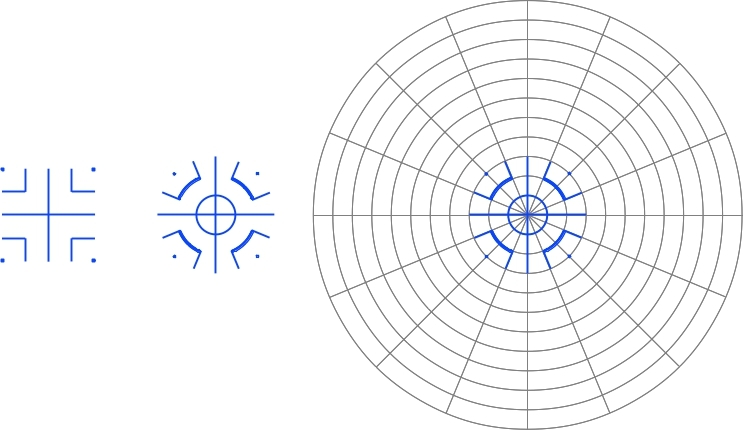 If we rotate the seed pattern one step further, the center is connected to the second next intermediate space. This again generates a Snail Shell labyrinth, however in anticlockwise rotation. And if we rotate the seed pattern one more step further, we will receive the Cretan labyrinth again, but also in anticlockwise rotation. 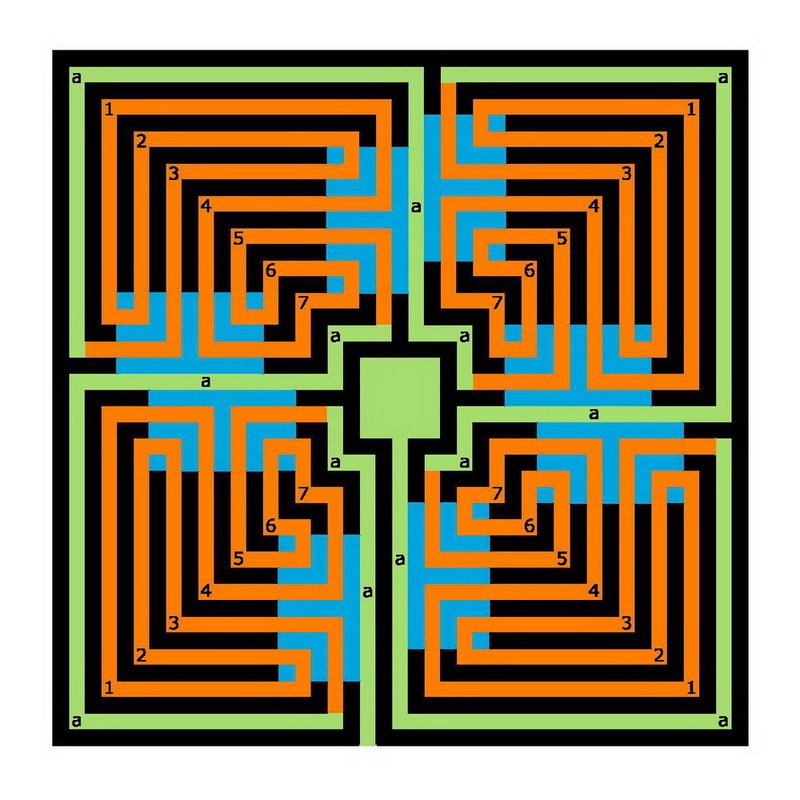 The MiM-style thus provides an actual layout of a labyrinth which enables us to do exactly the same as we did here on a more theoretical base, i.e., to rotate the seed pattern (a more detailed description of the whole process is provided here). This theoretical analysis was performed using the seed pattern for the Ariadne’s Thread of the Cretan-type labyrinth. 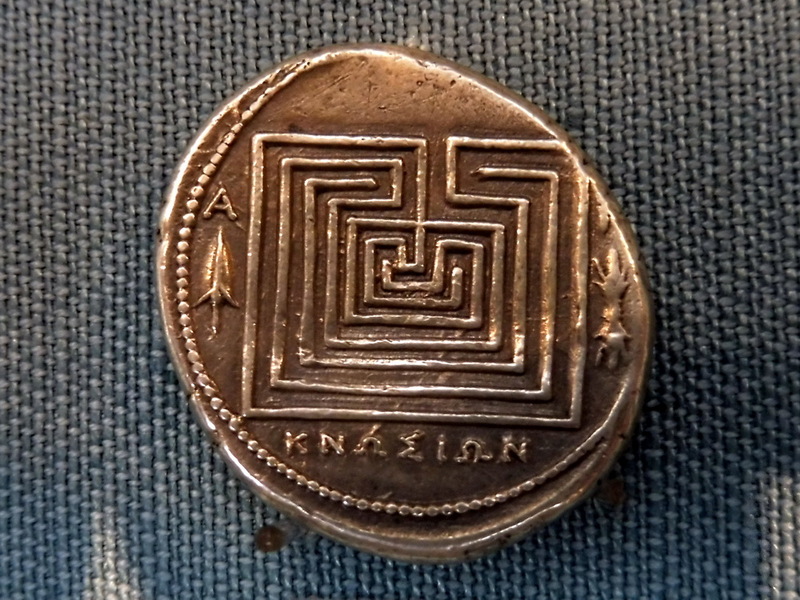 It predicted, that by rotating the seed pattern, only two different figures – the Cretan and the Snail Shell labyrinth – could be generated, each of them in clockwise and anticlockwise rotation. 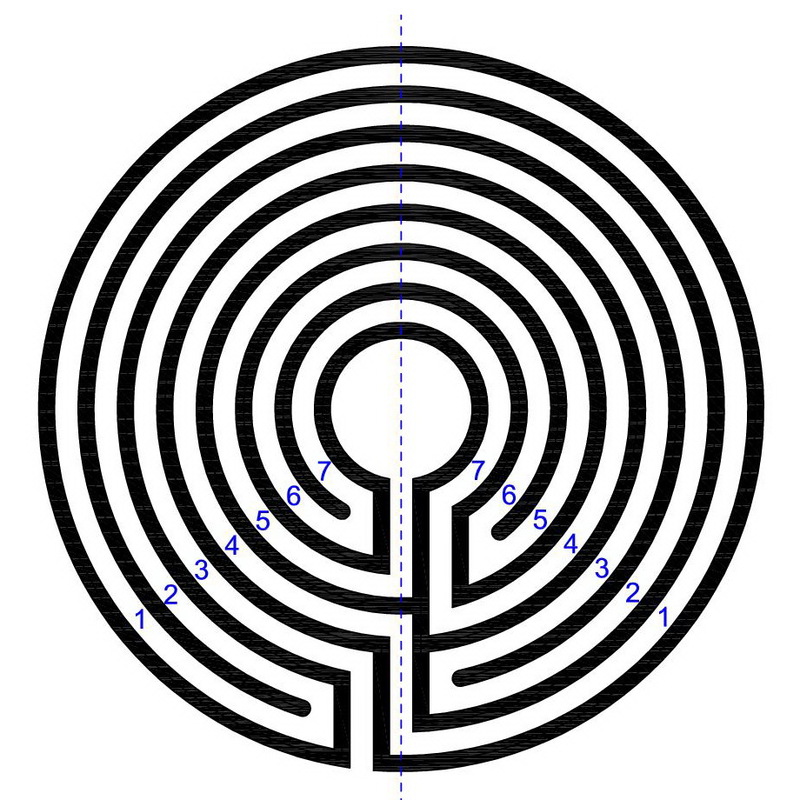 With the MiM-style labyrinths we have now an empirical proof of this result. Of course, it does not matter, whether the seed pattern for the walls or for the Ariadne’s Thread is used. Both lead to the same result although represented either by the walls or by the Ariadne’s Thread. In my theoretical analyses I prefer to use the representation with the Ariadne’s Thread as it is easier to read than the representation with the walls.